When the national government moved from Philadelphia to Washington, D.C. in 1800, the District of Columbia was little more than a mosquito-infested swamp between two branches of the Potomac, one of which would later be called the Anacostia River. Despite Pierre L'Enfant's dream of an organized grid of avenues in front of a grand capitol on the hill, the Frenchman's plans had not been realized. Conflicts had arisen, and President Washington had fired L'Enfant, who later bitterly but deservedly called the unfinished capital "a mere contemptible hamlet"--a place of dark, unpaved, muddy streets, hastily-constructed temporary buildings, open sewers, and little housing for the arriving stream of elected and appointed officials, supporting functionaries, and laborers. Where streets should run and sages ought to be. To this ugly duckling of a District came William Christopher O'Hare's immigrant ancestors, ready to carve out new lives in a fledgling place that, nonetheless, offered opportunities for those ready to build the navy fleet and feed, house, and entertain the masses. In 1807, only seven years after the U.S. government had moved to Washington, Richard O'Hare arrived from Ireland with his brother Christopher and sister Mary. According to a 1929 article about the older O'Hares, these immigrant siblings landed in Washington but soon moved to Philadelphia. Christopher became a Jesuit priest, and Mary wed Stephen Corcoran, who served as Consul General to Cuba. In 1812, Richard returned to Washington where he served in the 2nd Regiment [Brent's Regiment] of the District of Columbia during the War of 1812. On November 17th, he married Elizabeth Longdon. The couple's known children were John, Richard, Catherine, and Christopher. Son Christopher would become William Christopher O'Hare's grandfather. Like many Irish immigrants, Richard became a shipbuilder at the Washington Naval Yard. Workers typically labored for twelve-hour shifts, six days a week. Ships' carpenters were the civilian employees at the high end of the pay scale. Because the job paid daily wages and provided year-round, secure employment, many men stayed with Navy Yard jobs for life, and sons frequently followed in their footsteps. Because most people couldn't afford their own horses and buggies and no public transportation existed, workers lived near the shipyard and became part of one of the first established communities in the new capital. 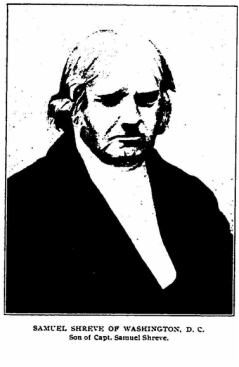 Samuel Shreve (1784-1862), father of Ann Shreve O'Hare, was the son of a New Jersey Revolutionary War soldier by the same name, Lieutenant Col. Samuel Shreve (1750-1814). Because the older Samuel Shreve and higher-ranking brother Israel belonged to a Quaker family and should have been pacifists, they are said to have been disciplined by the church for their military roles. Around 1880, the older Samuel moved to Arlington County, Virginia, and in 1881 bought land near Ballston. The National Park Service's Register of Historic Places report on the historic Cherrydale District (Arlington County) notes that the older Samuel Shreve owned 260 acres south of Cherrydale. The younger Samuel Shreve was also a prosperous farmer who reared a large family. Daughter Ann married Christopher Stanislaus O'Hare, son of immigrant ship carpenter Richard O'Hare. Ann Shreve and Christopher O'Hare would become William Christopher O'Hare's paternal grandparents. Lost trunk indicative of Shreve's prosperity and business dealings with son-in-law Christopher O'Hare, 1845. 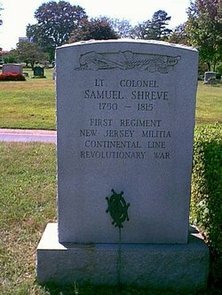 The older Samuel Shreve's headstone, furnished by the U.S. government and unveiled by the Farifax County Chapter of the Daughters of the American Revolution in 1909. 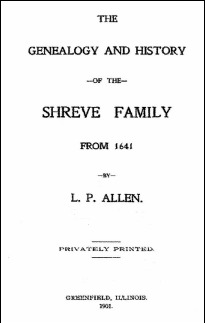 It is located in the Shreve family cemetery near Ballston, VA.
Samuel Shreve and his descendants, through W. C. O'Hare and his sons, appear in the Shreve family history privately published in 1901. Captain Henry Miller Shreve, for whom Shreveport, Louisiana, was named, descended from the older Samuel's brother Israel, a Revolutionary War officer whose correspondence with General George Washington is available on the Library of Congress American Memories website. Whether with an interest in seeing the city named for a relative or by coincidence, young William Christopher O'Hare would move to Shreveport in 1888 to pursue a music career. The earliest identified ancestor on William Christopher O'Hare's mother's side was Robert Brown, immigrant from Scotland, who arrived in the U.S. by 1793 with his wife Margaret and children Catherine, Mary, and Robert. The introduction of mechanicks and labourers from Europe being thought by the friends of the city so advisable a measure we have again taken up that subject; it may eventually be useful, perhaps almost necessary, and considering this a favourable time to hold out additional motives for Emigration, we shall endeavor to concert a plan with some of the Scotch merchants, to bring over some stone cutters and others from that Country. On January 5, 1793, the Commissioners again wrote Jefferson to send their plans for importing workers not only from Scotland, but also from Ireland, Germany, and France. At a time when Washington contained no more than 150 houses, many of them hovels, European papers were speaking of "7,000 houses built in a very handsome style." An 1896 London publication titled "Look before You Leap," warned prospective emigrants by including letters from those already in the U.S.,exposing Washington as a "dreary and malarial hamlet"--a far cry from the promised "magnificent city." By this time, Robert Brown, along with several other Scottish stone cutters, had already been hard at work on construction of the new United States Capitol and President's House. Among letters received by the Commissioners was one dated June 6, 1794, and signed by Robert Brown and three others: James Maitland, John Maitland, and John Delahunty. According to the letter, these men had been working twelve months, putting them in Washington before the cornerstone of the Capitol was laid on September 18, 1793. Another letter written to the Commissioners by James Maitland, John Delahunty, and Robert Brown on June 23, 1794, confirms that they had been contracted to build the Capitol's foundation. Subsequent records document payments to these men for their work. August 1800 Commissioner's reports include accounts for Robert Brown for his work on the Capitol and the President's House. On April 1805, Brown wrote President Thomas Jefferson, speaking of having been "foreman at the house your honour lives in until the chimneys was finished." Subsequently, other workers completed the non-stone portions of what would become the White House. Navy contracts at the National Archive include the hiring of Robert Brown and Lawrence Pearson "to finalize in a complete and workmanlike manner , the --- and stonework and plastering, & to do all things appertaining thereto of twenty-four [Marine] Barracks and Arcade . . . and to finish likewise a guard or officer's house in the Center of the range of Barracks. For the Marine Barracks, Brown and Pearson were to be paid $8,598.09. The June 12, 1801 contract was issued by William Marbury, Naval Agent, most famous for his role in the 1803 Supreme Court case of Marbury v. Madison. The contract appears in the naval records immediately before a contract with Paul Revere of Boston for copper work. Robert Brown invested his earnings in real estate. 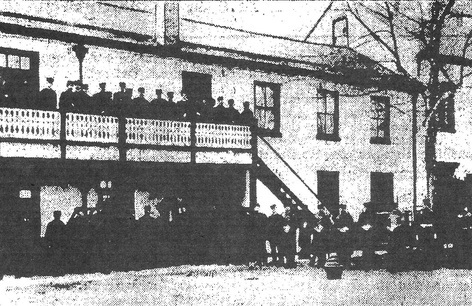 With little housing yet available for workers, the shortage remained a subject of grievances. On March 25, 1797, Brown purchased a lot at the corner of 12th and F streets, two blocks from Pennsylvania Ave and today's Trump International Hotel, where Brown built a three-story home for his family. In 1806, he purchased another lot on F Street between 13th and 14th. In 1808, he purchased two adjoining lots on 8th street across from the Marine Barracks. An 1866 book by Christian Hines, contained in the Rare Book collection at the Library of Congress, includes a list of houses standing in Washington by 1800. The square bounded by F and G and 11th and 12th contained only three houses: Brown's brick three-story, a two-story brick occupied by a Mrs. Wilson, and a one-story frame occupied by a Mr. McDaniel. 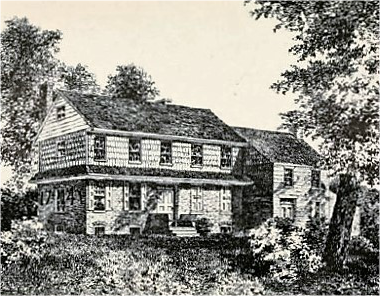 Approximately 1797, the older Robert Brown purchased a portion of the 3,860 acre Hermitage tract in Montgomery County, Maryland, east of Rock Creek, eventually moving to the country. Over the years, he added to his rural land holdings, amassing considerable property. On July 10, 1798, while playing his role in the construction of Washington, D.C., Robert Brown became a United States citizen. He died in 1815, a little more than a half century before the birth of descendant William Christopher O'Hare. The younger Robert Brown followed in his father's footsteps as a stone cutter working on the U.S. Capitol when it had to be reconstructed following its burning by the British during the War of 1812. This younger William, who had arrived in the U.S. with his parents, eventually married the American-born daughter of another immigrant, Michele Sardo. Young Michele Sardo (1777-1860) and wife Agata Gulielmini were the next immigrants on William Christopher O'Hare's mother's side and the parents of a daughter whose marriage would unite the Robert Brown and Michele Sardo families. Michele Sardo also contributed some of O'Hare's music genes. 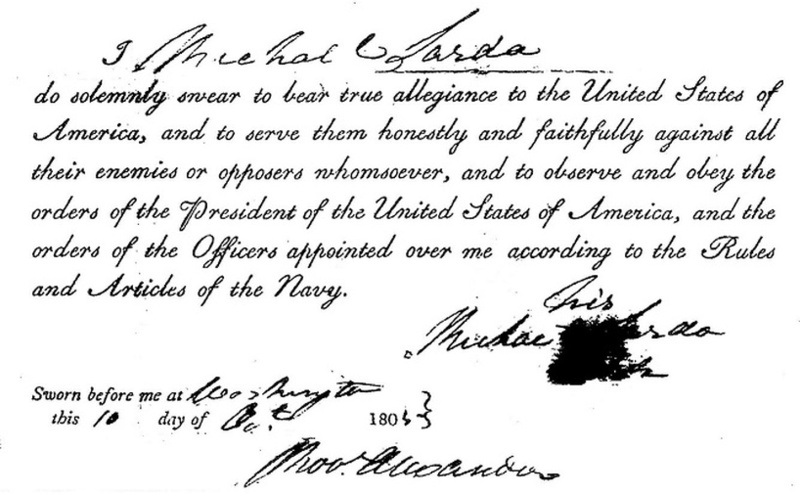 Michael Sardo (as Michele came to be known in the U.S.) was a clarinetist recruited by Captain John T. Hall in early 1805, along with Sardo's fellow band members from Catania, Sicily. According to various sources, President Jefferson had ordered Marine Commandant William Ward Burrows to procure musicians for the developing U.S. Marine Band, and the order had been passed down the chain of command to Captain Hall. I have never given orders for the collection of a band in the Mediterranean and it will not be mentioned as belonging to the Corps. . . The Secretary of the Navy can never consent to allow two Military Bands for one Corps. Whatever Commodore Barron told Captain Hall under orders from Jefferson and Burrows, Commandant Wharton's reply indicated trouble for the band members who had enlisted but would not reach Washington, D.C. for another half year. Accompanying Michael Sardo and wife Agata were daughters Marianina and Giuseppina, the latter a newborn. They would be known as Agatha, Mary Ann, and Josephine in the U.S. Unknown to the new band recruits and their families, the ship had been dispatched to fight the Barbary pirates, and some of the recruits found themselves assisting in battle, performing such functions as passing ammunition. On September 19, 1805, the band reached the Navy Yard where the Marines didn't want the Sicilians. Nonetheless, they had enlisted and within a month signed a more detailed agreement. Band leader Gaetano Carusi declared the new national capital "a desert, in fact, a place containing some two or three taverns, with a few scattered cottages and log huts." The band and family members were initially quartered in Marine barracks at the Navy Yard. Thirty people, counting the musicians' families, crowded into a room where they slept on the floor. In the meantime, the poor people agreed to turn out together in search of some habitable place, but their labors were useless. Signor D. Felice Pulizzi and signor D. Pasquale Lorio, whose two families amounted to about one dozen souls, set out in search of some cabin or anything else that would afford them shelter; but they sought in vain. They found at length a place destined for the shelter of cows, and this they appropriated for their own residence; thence were they driven by order of the colonel of Marines, the owner having learned with dissatisfaction that men had usurped the resting place of his cattle. Michele Sardo, Domenico Guarnaccia, and their families were described as the lucky few. A local resident allowed them to move into the kitchen detached from his home for $5 a month. In the words of Carusi's claim, rather than "being employed and paid for the term of three years, he was dismissed before the expiration of two years." James R. Heintze has written an extensive account;well-documented scholarly account of the Sicilian band, focusing primarily on leader Gaetano Carusi: "Gaetano Carusi: From Sicily to the Halls of Congress," American Musical Life in Context and Practice to 1865 (New York: Garland Publishing , 1994), 75-131.